Science and innovation are cornerstones of our business at Newton Running. Over ten years ago, when Newton Running first started testing radically different running shoe prototypes and recognized the importance of quantitative, scientific results to prove Newton technology designs worked. However, one of the first lessons was that current lab testing is antiquated and frustrating ‘science’ at best. For years now, the standardized running shoe lab test has consisted of a piston that hammers down on the heel of a shoe to test cushioning. 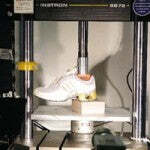 There are numerous problems with this testing method, but first and most obviously, it only evaluates the heel – not very useful for Newton shoes, which focus technology in the forefoot of the shoe. “Current ASTM tests on running shoes are insufficient because they do not reliably capture the loads and displacements applied to shoes during running. This team will discuss a 3-axis machine that can be used to test running shoes that mimic’s natural running more accurately than conventional tests. The design is comprised of a phantom foot that replicates the passive properties of a human foot and an actuated base that can impose the relevant kinematics to the running shoe. The shoe is mounted on motor to give a rotational degree of freedom. 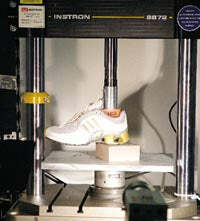 The shoe and the base are instrumented to measure force and displacement dynamically during the running cycle.